Sunday’s slate of Big East results did quite a number on the projected NCAA Tournament bids, according to TRank’s TourneyCast tool. Not only did it eliminate the slimmest of possibilities the conference could get a record 7-team haul, it moved the likelihood of getting 5+ bids from 40.5% to 29.6%. That may seem like small blip for something already unlikely to happen, but amounts to a seismic movement when we’re talking about season long projections for 10 teams. But that’s what will happen when the team with the 3rd best odds, but a flimsy resume, gets upset at home by a team with the 3rd worst odds, coupled by a team with the 5th best odds losing by 30+ on the road. If DePaul would have pulled off the upset, it truly would have been a catastrophic day for the leagues NCAA hopes. But as Providence only has a 6% probability of making the dance, it didn’t affect the odds all that much. I mentioned last week that the Big East was cannibalizing itself as there was no true bottom tier in terms of performance, only resume. So while DePaul, Xavier and Georgetown did not do enough in the non-con to be invited, they weren’t bad teams, per se, and would cause plenty of issues to teams that did have NCAA chops. It also doesn’t help that the teams with an outside shot at the bubble are currently playing some of the worst ball in the league. It would be one thing if Creighton was beating up on St. John’s who was beating up on Seton Hall who was beating up on Butler who was beating up on Creighton. That sort of circular set of results tends to boost the number of bids, while only depressing possible seeds. Instead the bubble teams are losing to everybody, playing poorly in the process. And even as I slot those 4 teams as bubble worthy, their non-con resumes weren’t strong by any stretch of the imagination. Butler: 2 top 50 wins over Florida (26) and Miss (40); Sub 50 loss to Dayton, sub 100 to St. Louis; 30 point defeat at Florida. Creighton: 1 top 50 win over Clemson (50); 4 top-35 KenPom losses. St. John’s: 0 top 50 wins. And unlike previous years, there was no Villanova ranked in the top-5 to constitute a big win possibility. Sure, Marquette and Villanova are now both in the top-25 of the NET, but they are only good wins, not great wins that can offset some bad losses. Add this all up and you can see why the ceiling on Big East bids has been getting lower and lower. But that got me thinking, is that a bad thing? This question stems a bit from a conversation on Twitter early this month. If it does, I'm guessing it only gets 4 bids. Ideally, you want a couple elite teams and a plethora or good (bubble) to great (lock) teams every season, much like the Big East had in 2018. But the non-con results nipped that in the bud by early December. So the question becomes, if the Big East had a hand in “maneuvering” outcomes, what would be the best scenario for the conference as a whole? (As a reminder, each NCAA tournament win is worth more than $1.6M per year for the next 6 years to the league as a whole). If the league does have a cap of 4/5 teams, ideally you’d want those teams to have the best seeds possible. 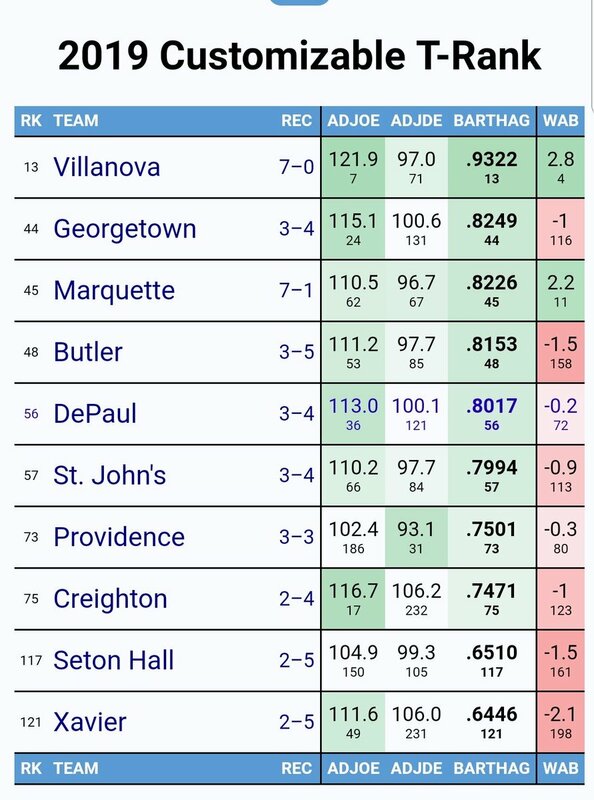 The current projection on TRank has Villanova at a 4.7 seed and Marquette as a 5.1 seed, so barely protected top-4 seeds, with all other possibilities being an 11. Rounding the seeds up a bit, and using this ESPN article’s PASE measurements for expected wins per seed, getting a a 4, 5 and three 11 seeds would give the conference a projected total of 4.19 wins. If Marquette and Villanova only lose to each other at home going forward (a very unlikely proposition), Villanova and Marquette would both get a 3 seed while the other 2 seeds would be an 11 and a 12. Add that up and you get 4.56 projected wins. That .37 differential is really small, though that’s just based on historical averages, and may not seem “worth it.” In years with a particularly top-heavy cadre of teams, there isn’t much difference between a 3 or a 2, as both would be expected to face an elite team in the Sweet 16. 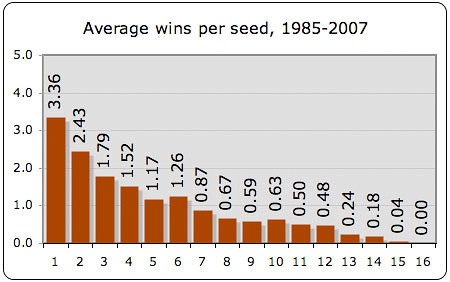 But in most years, the gap between 1-seeds and 2-seeds can be quite large. Duke (a projected No. 1) would be an 8-point favorite on a neutral court against North Carolina (a projected 2) today. Frankly, I don’t think there is a “correct” answer as to what would be best for the league, as the NCAA Tournament has no guarantees any more, not even a 1 beating a 16. Xavier made it to the Elite 8 as an 11 seed and didn’t make the second weekend as a No. 1. And that’s just in the past two years. My preference would be for Marquette and Villanova to continue to win out and continue to climb into the AP poll, as that does drive a fair bit of attention to the regular season, but without a possibility of either cracking into the top-2 seeds, I don’t think the difference between the 3/4/5 seeds is great enough to warrant league manipulation. Ultimately, it comes down to teams like St. John’s and Seton Hall not losing to Georgetowns and DePauls and Xaviers at home. And the way these teams have trended no amount of interference will matter that much.